Scott Walker, Wisconsin's governor and a Republican contender for job of president, has been mocked non-stop online since raising the idea of building a mammoth security wall along the Canada-U.S. border. Scott Walker, the governor of Wisconsin and a Republican contender for the president's job, has been ridiculed online since raising the idea of building a mammoth security wall along the Canada-U.S. border. Walker entertained the idea during an interview on NBC's Meet the Press on Sunday, where he called the wall a "legitimate issue." It's rare to see the Canadian border being discussed during a presidential campaign, as candidates more often talk about the southern border. Walker's fellow presidential candidate, Donald Trump, has called for a "real wall" to be put up between the U.S. and Mexico. And he plans to get the Mexican government to pay for it. 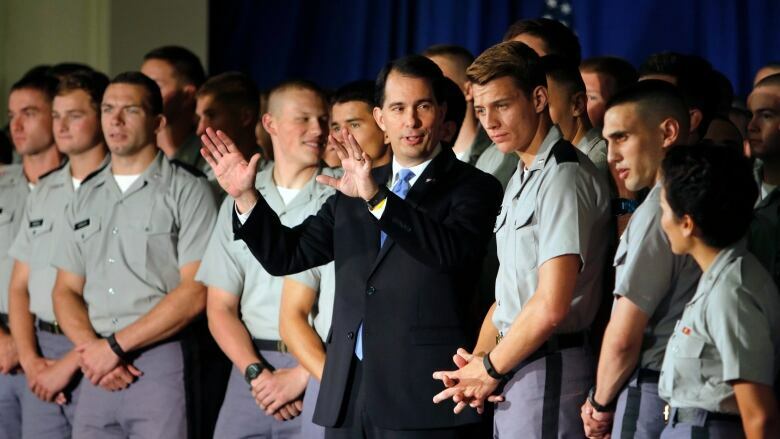 I do agree with Governor <a href="https://twitter.com/hashtag/Walker?src=hash">#Walker</a> that "Canada Wall" would be a sweet punk rock band name. <a href="https://twitter.com/inreallifealex">@inreallifealex</a> Our skates are sharpened, we're coming for their cheese! Of course, the Democrats also got in on the fun with a little help from Kanye West (another possible presidential candidate?). Fellow Republican presidential hopeful Rand Paul took a jab at Walker too. The Kentucky senator told a Boston radio station that a wall between Canada and the U.S. would be a "pretty dumb idea." ... while others put some serious thought into the logistics of how it would be built. It would be a long wall. The border stretches 8,891 kilometres across land and water. ... while many Americans just felt sorry for Canadians altogether. Frankly, I'm surprised Canada hasn't already built a wall to keep us out.